Emperor Rum is a blend of Mauritian aged rums stemming from distillation of pure and fresh sugarcane juice and molasses. The brand takes its uniqueness from the Mauritian soil, climate and traditional know-how. The astounding palette of colours and flavours is the result of a complex blending of freshly squeezed sugarcane, roasted exotic fruits and flowers ending with pepper and spices accents in the typical Mauritian tradition. 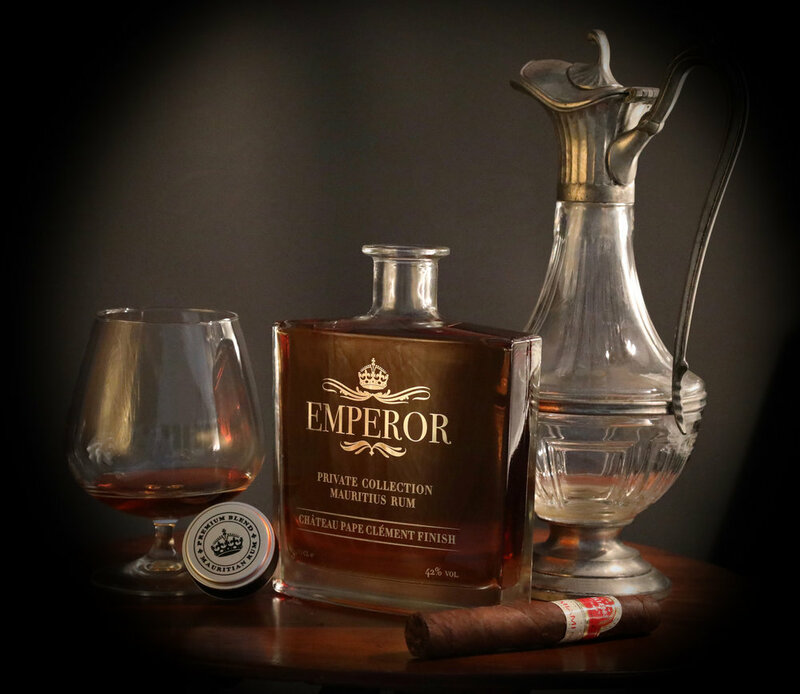 Emperor Rum has an intimate understanding of the character of each selected aged rum and knows how to enhance every ingredient. We pay meticulous attention to the casks and the way they interact with all the rum components. During the long ageing and blending processes, the rum is regularly tested in accordance to both traditional and modern techniques. Depth of skill, dedication and deep knowledge of rum gave birth to Emperor Rum. Our unique rum blend, steeped in the island’s history, is both an art and a science. Today, Emperor Rum is the custodian of an extraordinary legacy and can definitely be considered an authority on aged rum blending. The specific combination of Mauritius volcanic soil, microclimate and altitude creates the perfect condition for the finest rums. The historical evolution of the rum industry in Mauritius is worth as much as that of the Caribbean or South America. Moreover, our traditional and modern techniques together with our master blender’s perfect expertise of production and ageing process enable us to produce the best-tasting Mauritian rum. Sugar cane was introduced from Java in Mauritius under the Dutch period (1598-1710), mainly to produce an alcoholic drink through fermentation. During his service in the 18th century, the French Govenor, Bertrand-François Mahé de Labourdonnais, was the first to support the development of the rum industry in Mauritius. As from 1810, Mauritius became a British colony and gradually transformed itself into a plantation economy with sugarcane as the primary crop. Later, in 1852, Dr Pierre Charles François Harel became the mastermind behind the concept of rum distillation on the island. Mauritius is now home to six distilleries, among which two have left their mark on the history of our sugar estates. Emperor Rum was created with our august history and majestic qualities in mind. The choice of our effigy had to embrace all these features and naturally fell on the iconic Emperor Georges V, who was King of the United Kingdom and the British dominions, and Emperor of India. It is the unique association of the care we put into our sugarcane cultivation and the precision we invest into our distillation processes which instils into our rums their unmatched authenticity and originality. Presently, traditional rum represents about 90% of the world rum production. Mauritius is one of the few countries that produces both Traditional and Agricultural rums. Mauritian distilleries have been investing in both methods of rum production, namely the Pot-still and the Column processes. After distilling, the rum is stocked in French and American Oak barrels, while other industry’s stakeholders have invested in sherry and Sauternes casks to create new types of rum. As for Emperor Rum, we chose to express its unique flavour and sun-filled bouquet in oak barrels.